Mark Carney has expressed growing concern about stranded carbon assets. “I’m going to give you a speech without a joke, I’m afraid.” Wearing a crisp black tuxedo, Mark Carney, the 50-year-old former governor of the Bank of Canada, looked out at the black-tie crowd arrayed before him in the cavernous underwriting hall of Lloyds’ sleek head office and embarked on a speech that would reverberate like a rifle shot through the world’s financial capitals. 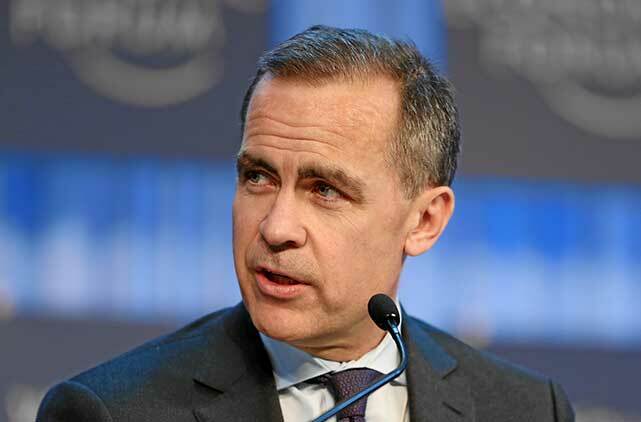 It was last September, and Carney, presently the head of the Bank of England, had signalled to British parliamentarians that his institution, and the international Financial Stability Board, which he chairs, had just begun an in-depth examination of the systemic risks posed not just by climate change, but by the “unburnable carbon” thesis advanced by the Carbon Tracker Initiative several years prior. According to the London-based group, the only way to limit global temperature increases to 2 C is to leave vast fossil fuel reserves in the ground – a scenario that could have cascading implications for not just the global energy sector but the investors and governments banking on future profits from those assets. Carney, a central banker known for his keen interest in financial stability policy, was taking Carbon Tracker’s analysis seriously, and had chosen to venture deep into the heart of the industry most intimately associated with risk mitigation: London’s insurance sector and its most venerable player, Lloyd’s Register, the 325-year-old underwriting giant. After praising insurers for developing new products geared to emerging risks, including the accelerated pace of climate disasters, Carney challenged his audience to ponder the “tragedy of the horizon.” The long-term economic reality, he said, is that only about a fifth to a third of proven fossil fuel reserves can be burned if temperatures are to stay within two degrees of pre-industrial levels. At the conclusion of the Paris climate conference, nearly 200 national governments pledged to balance renewables and fossil fuel-based energy by 2050 as part of their goal to cut emissions and keep average temperature increases to “well below” the 2 C cap. Developed countries pledged $100 billion (U.S.) per year to developing nations to finance clean energy. But quite apart from the cumulative impact of these moves, Carney says the custodians of the global economy must begin to think hard about the fact that so much future wealth has been pegged to assets that may be stranded, and thus dramatically overvalued on corporate balance sheets and pension fund portfolios. In an updated study released in late November, Carbon Tracker estimated that oil, gas and coal sectors have proposed $1.9 trillion in capital investments to access known reserves through 2035. If tapped, the emissions would exhaust the remaining carbon “budget” for the century – i.e., the total amount of fossil fuel that could be burned before the temperature noses above that 2 C threshold. But those investments are directed to extracting only about a fifth of all identified fossil fuel reserves. Everything else, Carney told the financial executives at Lloyds that evening, is a “carbon bubble” that could potentially pop, or at least deflate rapidly, creating chaos in the global financial system. How much chaos? “We estimate that the total value of stranded assets could be over $100 trillion based on current market prices,” concluded a report released by Citigroup in August. It’s not so much what Carney was saying, but rather that he was the one saying it. The unburnable carbon message has reached the mainstream with breakneck speed, being endorsed by major financial institutions such as HSBC, Citigroup and ratings agency Standard & Poor’s. The heads of the UN, the IMF and the World Bank have all endorsed its findings, while recent speeches by U.S. President Obama and other world leaders have also made mention of unburnable carbon. But one no-go zone had remained the change-adverse world of central banking – until Carney began speaking up. Beyond that, Campanale feels Carney’s speech at Lloyds ranks with Pope Francis’s heavily publicized pre-Paris homily about the moral imperative to tackle climate change. “It’s difficult to say which was more important,” he said. Carleton University climate scientist John Stone, a vice-chair of one of the Intergovernmental Panel on Climate Change working groups, says Carney’s concern about the economic implications of global warming go back to his days as a senior policy official in Ottawa, when he’d listen intently to briefings on the topic. “He’s a very serious individual with an understanding of the urgent threat of climate change in economic terms,” says Stone, who compares Carney to Lord Nicholas Stern, the noted British economist and author of a ground-breaking 2006 evaluation of the economics of climate change. The headline in the Financial Times a few days after the speech read “Mark Carney’s climate warning splits opinion.” Love it or hate it, his message has proven impossible for financial markets to dismiss. Carney’s journey from his childhood home in Edmonton, Alberta, to a starring role in the climate mitigation drama has been anything but linear. He attended Harvard and later completed a PhD in economics at Oxford. Early in his career, Carney headed to New York and worked for over a decade as an investment banker at Goldman Sachs. Tiring of Wall Street’s relentless pace, he returned to Ottawa in 2003 on an invitation by then governor David Dodge to join the Bank of Canada. A trim and famously self-possessed figure with a knack for marathon running, Carney spent only a year as a deputy governor before jumping to the federal Department of Finance, where he was involved with hot potato files, such as plugging the income trust loophole that allowed billions of dollars to bypass government coffers. In 2008, Carney was appointed to succeed Dodge, and almost immediately found himself dealing with the fallout of the asset-backed commercial paper (ABCP) fiasco, which involved the meltdown of a speculative market of junk-bond-style assets. The ABCP debacle, of course, was a kind of trial run for the 2008 global credit crisis, precipitated by Lehman Brothers’ collapse. Canada’s banking sector survived the mayhem because in the years prior to the collapse, senior government officials, Carney among them, had pushed back against pressure from the banking industry to ease loan-loss reserve rules and allow more trading in the sort of exotic speculative investments that crushed financial institutions in New York and London. In early 2009, G20 leaders gathered in London to consider the wreckage of the global economy. 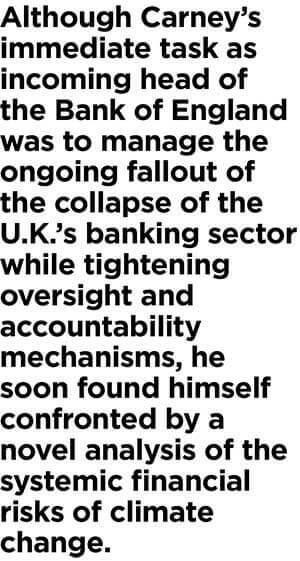 Carney, who was regulating a financial system that hadn’t imploded, emerged as an outspoken proponent of what he referred to as national and international “macroprudential” regulation – essentially, oversight bodies tasked with taking in the view from 40,000 feet. The credit crisis had revealed the multi-dimensional vulnerability of the global financial system, and showed how seemingly sturdy banking institutions like the Bank of Scotland or the ING Group could be waylaid by a frenzy of split-second trading in unregulated derivatives, some of which had no discernible connection to underlying assets. Coming out of that recession, the G20 created the Financial Stability Board (FSB), at least partially because of Carney’s advocacy in favour of an institution mandated to prevent disasters. In Stephen Harper’s Ottawa, however, the central banking superstar had lost some his lustre after rumours surfaced that Carney had spoken privately with Liberal insiders about a possible political career. Unlike his predecessor, Carney left the post after just one term and accepted, in 2012, a gig as governor of the Bank of England – the first “foreigner” to have ever held that job, as the quality press in the U.K. was quick to note. Although Carney’s immediate task as incoming head of the Bank of England was to manage the ongoing fallout of the collapse of the U.K.’s banking sector while tightening oversight and accountability mechanisms, he soon found himself confronted by a novel analysis of the systemic financial risks of climate change. Carbon Tracker chose a provocative title for its first report on the subject: “Unburnable Carbon: Are the world’s financial markets carrying a carbon bubble?” The authors pulled together scientific data on the pace of carbon loading in the atmosphere and the estimated book value of known fossil fuel reserves to calculate the maximum amount that could be extracted and burned, given the scientific and policy consensus on the tolerable limits of global warming. The startling feature of Carbon Tracker’s analysis is that it moved way past the more established debate about the impact of carbon taxes or emissions trading credits on the price structure of energy and painted a radically different future for the fossil fuel sector, driven, as it is, by forward-looking exploration activity. A large part of a fossil fuel company’s share value is currently driven by the reserve replacement ratio, which means that future reserves should remain above 100 per cent. When a company ditches an expensive project, even if it’s not financially viable, it reduces its reserves and negatively impacts the stock price. Roger Martin, a professor at and the former dean of the Rotman School of Management at the University of Toronto, argued in a recent Harvard Business Review column that oil executives are reluctant to cease or slow exploration efforts because any deviation from what is planned would signal to investors that even their current reserves are overvalued. “It’s not clear just how far their value would fall if the petroleum companies ever hinted that the end of their dance was near, but the drop would probably be monumental,” he wrote. These implications fall squarely into Carney’s wheelhouse, because they expose deeply buried fractures – like those left in bedrock due to fracking activity – in far-flung financial systems. Major pension and mutual funds that hold fossil fuel stocks may be holding, and reporting, overvalued assets on their books, thus exposing policy holders and investors to long-term losses. Governments that rely on resource royalties base their forward fiscal planning on revenue assumptions that may prove to be shaky. And financial institutions continue to advance giant loans to energy multinationals based on balance sheets that could turn out to be littered with stranded or overvalued assets. Carney has since taken unprecedented key steps to uncover the subtle systemic risks linked to climate change. After an entire day dedicated to the subject of stranded fossil fuel assets, the FSB embarked on a detailed study on how best to create standardized disclosure rules meant to inform investors about the risk of potentially stranded fossil fuel assets. In response to a House of Commons environment committee request, Carney last October also committed the Bank of England to expanding its investigation of the U.K.’s exposure to such risks. At the Paris climate conference in December, Carney announced that the FSB is establishing an industry-led disclosure task force on climate-related financial risks under the chairmanship of former New York City mayor Michael Bloomberg. The task force will develop voluntary, consistent climate-related financial risk disclosures for use by companies in providing information to lenders, insurers, investors and other stakeholders. It appears that Carney’s outspoken position on the risks of unburnable carbon has inspired Bank of France governor François Villeroy de Galhau to join the fray. In one of his first speeches since being appointed, he strongly endorsed both the Bloomberg-helmed FSB initiative as well as new French regulations requiring large institutional investors to disclose the carbon exposure in their portfolios. At the same time, he called for greater regulatory action to ensure that the financial sector falls in line with the 2 C carbon goal. Speaking in French, Villeroy de Galhau told a conference held concurrently with the COP21 climate talks in Paris that these moves will allow stakeholders and the general public to get a better sense of the share of assets related to carbon emissions in the financial sector and its exposure to climate risks. Such outspoken concern about stranded assets has not been on display in Carney’s former position at the Bank of Canada (BoC). A BoC spokesperson says the institution won’t discuss systemic climate-related risk embedded in the Canadian economy, describing such analysis as beyond its mandate. The Office of the Superintendent of Financial Institutions is somewhat more forthcoming, and says it monitors risk to banks and property and casualty insurers related to environmental catastrophes. Should Carney’s successor at the BoC, Stephen Poloz, be publicly discussing the carbon bubble and the systemic risk to Canada’s economy? Carbon Tracker’s Campanale has no such qualms. In his view, the Bank of Canada or Canada’s other macroprudential watchdogs need to unpack several key questions in order to take a reading of the quantum of the long-term risks. Officials should look at the degree to which Canadian capital markets are entangled with fossil fuel and related sectors, and then stress-test those markets, as bank regulators did five years ago with financial institutions, to get a picture of the impact of a “disorderly transition” away from fossil fuel. Campanale also thinks Canada’s pension overseers need to assess the long-term exposure of large public sector pension plans, like OMERS, to stranded assets linked to unburnable carbon. Lastly, Campanale points out that Canada, as a member of the G20 and thus a participant in the FSB, should move to require issuers to do a much better job of disclosing stranded asset risk to investors. “Any central banker who has oversight over markets has to take a similar approach,” he says, adding that Carney has been clear about a key point, which is that markets will re-price these assets once investors know whether those future oil fields in Alaska or other hotspots will ever be able to produce. In many ways, Carbon Tracker’s stranded assets campaign has spawned the noisy debate over fossil fuel divestment that grabbed headlines and dominated some political agendas in the past year or so. With Alberta, the U.K. and most U.S. states phasing out coal plants, and with large state pensions, philanthropic and sovereign funds hustling to decarbonize their investment holdings, it seems as if the dirtiest and most carbon-intensive fuels could soon be phased out, or at least consciously excluded. The precipitous decline of coal and falling price of oil has allowed some analysts to demonstrate with real numbers the impact of holding on to high-risk fossil fuel stocks until they’re well beyond their best-before date. 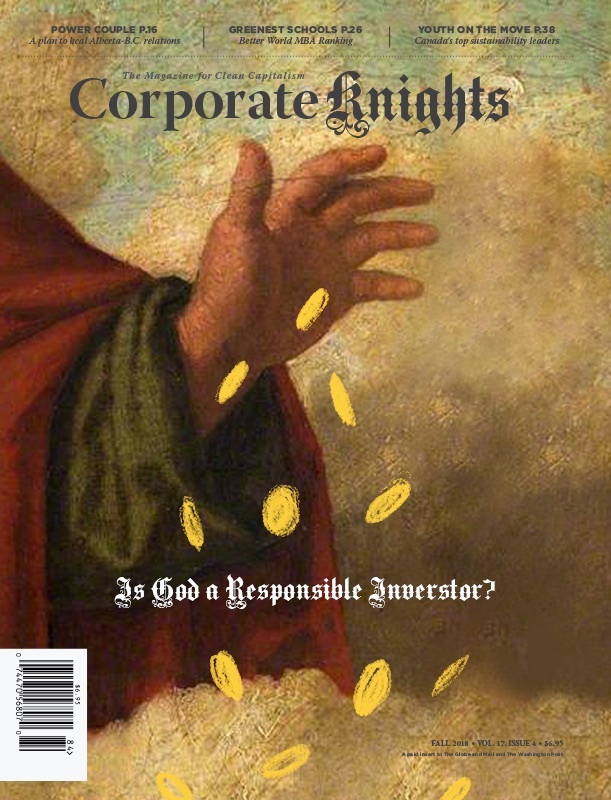 When Corporate Knights applied its Portfolio Decarbonizer to the University of Toronto’s endowment fund, the analysis showed that the pool would have avoided paper losses of half a billion dollars had it sold its carbon-heavy oil and coal assets three years ago. Still, the pace of change away from carbon and towards a global-scale adoption of renewables is unlikely to be linear. Clean energy experts point to the accelerating decline in the price of solar energy in just five years – a dynamic driven both by the technology and China’s big bet on an industry designed to make the air breathable in its largest cities. One need only look at the information sector to see how epic, industry-crushing, industry-creating changes play out in a decade, or less. It’s a point not lost on Carney, who is, after all, entirely comfortable in a room filled with people professionally predisposed to ponder what lurks around the next bend in the road. Towards the end of his barn-burning speech at Lloyds, he mused that green finance cannot possibly remain a “niche interest.” But in the next breath, Carney fretted about the converse – how a rapid transition to a low-carbon economy could unwittingly destabilize capital markets that were actually managing to wriggle their way out of a destructive addiction to depleting fossil fuels. Not one to end on a sour note, the superstar of central bankers brought his talk back to the kind of language global bankers know well.